Kindof given up on this now. It was supposed to be "imminent" when the UK press were talking about it back in March. 8 months later and I suppose that its just never going to be released outside of the USA. Absolutely no reason why not.... but hey. Yeah great stuff!-cant believe it took so long!-all it does is keep the blue ring lit longer! Just checked and it's arrived on mine too!!! It's actually quite sad how please I am to see this. While it appears to only keep the blue ring on longer, it actually allows you to ask followup questions without repeating the entire question. For example, you can say, "Alexa, how old is Tom Hanks?" -- you'll get the answer from Alexa -- then you can say "Who is his wife?" and Alexa will know you're still talking about Tom Hanks. ...ok guys....i am preparing myself to be excited....but how do i select it?? Have new Dot 3 and if you wade through all the options and find reference to it - it says'more about follow up' you press that and it then says select a certain Symbol - Cant see it anywhere! I loaded PC App from the amazon alexa co UK site - are you using the ,COM site? 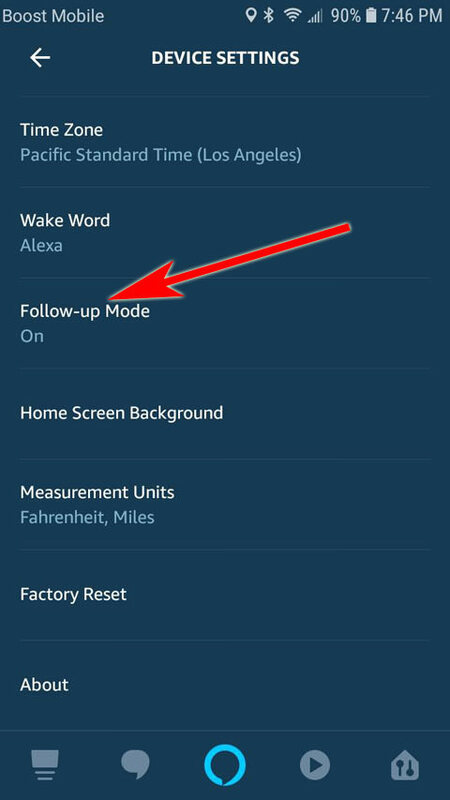 If your Echo device supports follow-up mode, here's how to enable it. Before you start, make sure you have the latest version of the Alexa app. Check your phone's app store to see if there's an update. From the Alexa app on your phone, tap the menu icon at the top/left corner (it looks like 3 horizontal bars). Then tap Settings. And tap Device Settings. All of your Echo devices and smart devices will be listed. Choose one of your Echo devices. Then you'll see all the settings you can change on that Echo device. It should look like the picture below. If yours doesn't look like this picture, it probably means that Amazon has not enabled the follow-up mode for your region/country. What device do you have the Amazon Alexa app installed on? The Follow-Up Mode option should be just below the Wake Word option on that page. sorry but you guys are missing the problem - yes the follow on is listed where you say, but wont highlight for toggle selection - the only availability is 'learn more' which tells you to presss an icon that doesnt exist! !